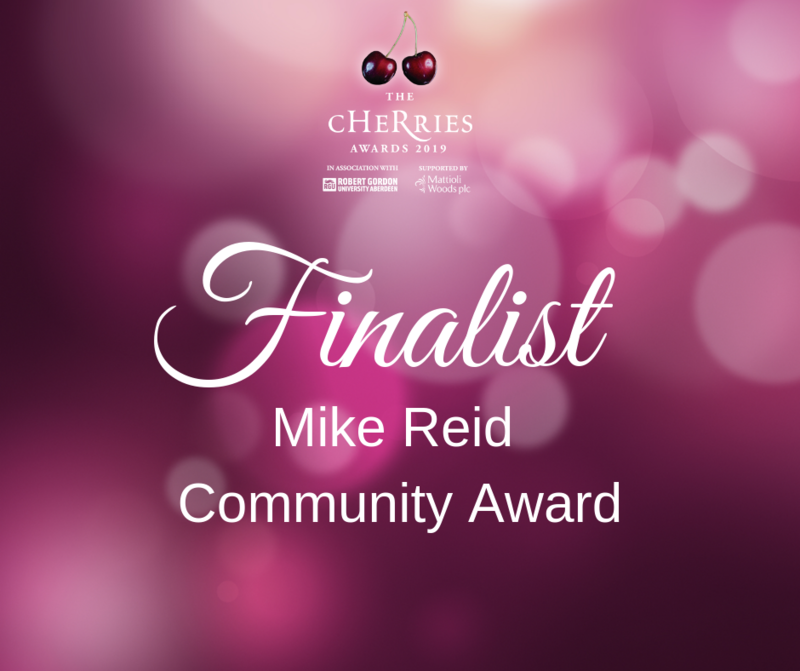 AYP founder Ross Jolly has been shortlisted for the Mike Reid Community Award at the forthcoming Cherries Awards. The award recognises someone in the field of HR who, out with their day to day job, continually commits their time and efforts to volunteering, fundraising or otherwise supporting good causes in their community.An ordinary person doing extraordinary things for their community. AYP Committee Member Stacy Edghill has also been shortlisted for the award, best of luck to team AYP! AYP Increase the committee to ten - in time for the tenth anniversary in 2019! AYP were delighted to welcome new members who had shown an interest in supporting the group and organising exciting new events for our membership. 2019 saw the group welcome Claire Forbes, Nia Lynch, Leonora Brebner, Danny Collie, Mike Al Alawi and Jordan Rowson to the existing team. Nia and Leonora joined Paddy in rolling their sleeves up and organising our first social networking event of the year at the stunning Sandman Hotel. Follow the group on our social media channels for further updates on our events schedule for 2019. We look forward to seeing you! Aberdeen Young Professions (AYP) – now in its ninth year – recently held its annual AYP Ball, raising £1,500. 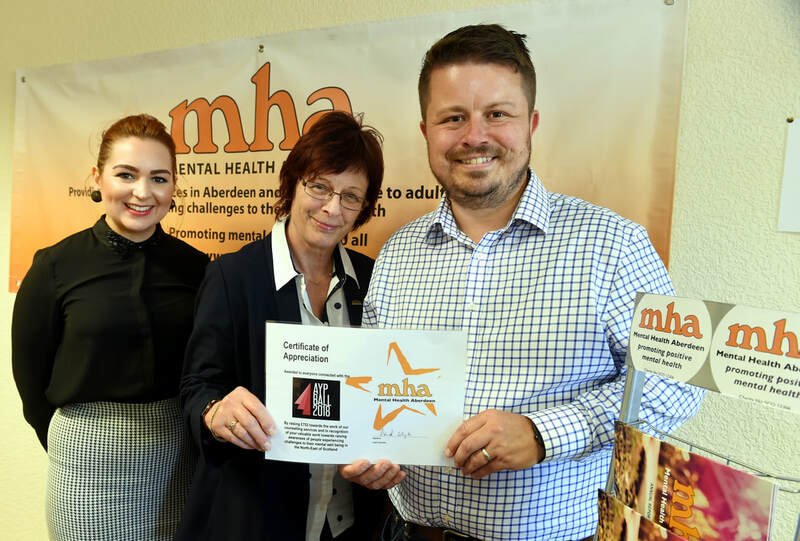 The figure has been split evenly between nominated charities, Mental Health Aberdeen (MHA) and Maggie’s Aberdeen. AYP welcome new Committee members! Aberdeen Young Professions (AYP) – now in its ninth year - has welcomed two new members to its management committee in a bid to build on its already successful events and mentor programmes. 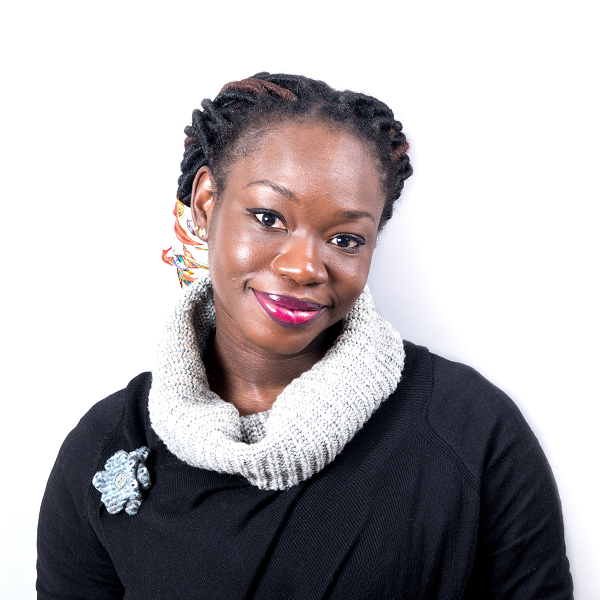 Yekemi Otaru, Director at YO! Marketing Ltd, will assist the committee with enhancing its social media platforms, having written a best-selling book on the subject. She has also been working with AYP for the last two years as a mentee. 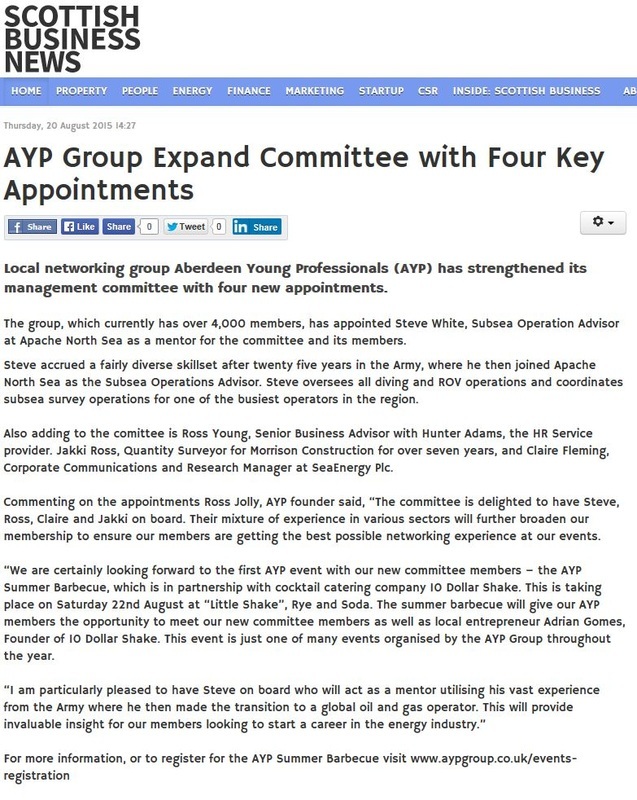 Meanwhile, Sarah Fowler, who works in marketing and communications for energy services company Proserv, will coordinate communications to, ultimately, maintain and enhance AYP’s profile in and around Aberdeen. Ross Jolly, Founder of AYP, said: “Following the success of our annual AYP Ball in April, we are looking forward to launching the remainder of this year’s events which will be themed around preparing people for the work place. The Mentorship Scheme for 2017/18 reaches its climax after the Mentee and Mentor of the Year awards are announced at the annual AYP Ball. 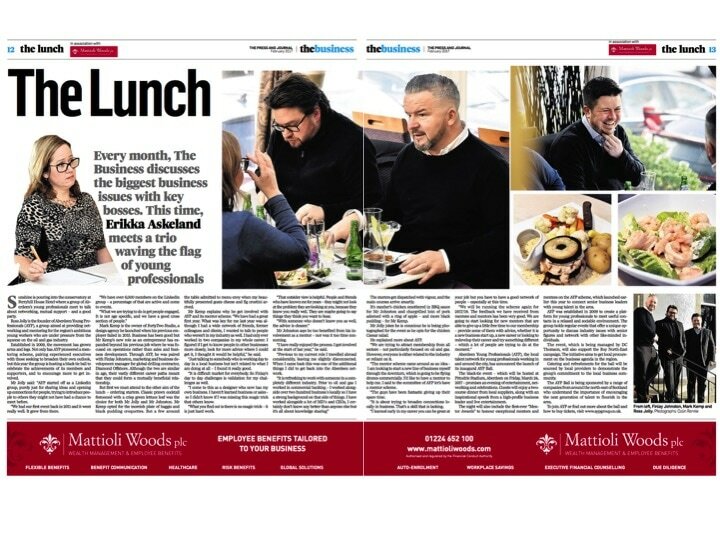 Aberdeen Young Professionals (AYP), a networking group for young professionals working in and around the city, has partnered with PR, marketing and design agency think Group, as it aims to guide and inspire ambitious individuals. Think will support AYP and raise awareness of the organisation and its calendar of events, helping to engage talented professionals in Aberdeen City and Shire. Ross Jolly, founder of AYP, said: “We are delighted to be working with think to promote AYP and everything it has to offer. The team has a tremendous amount of experience working for a wide range of businesses, with an impressive track record, and truly understands our ethos and the difference we hope to make to young professionals in the region. At its regular events, which consist of discussion series, networking opportunities and social meet-ups, AYP provides an opportunity for members to network with like-minded individuals and make new contacts in a relaxed environment. The group currently has more than 6,000 members. AYP have new PR partner! 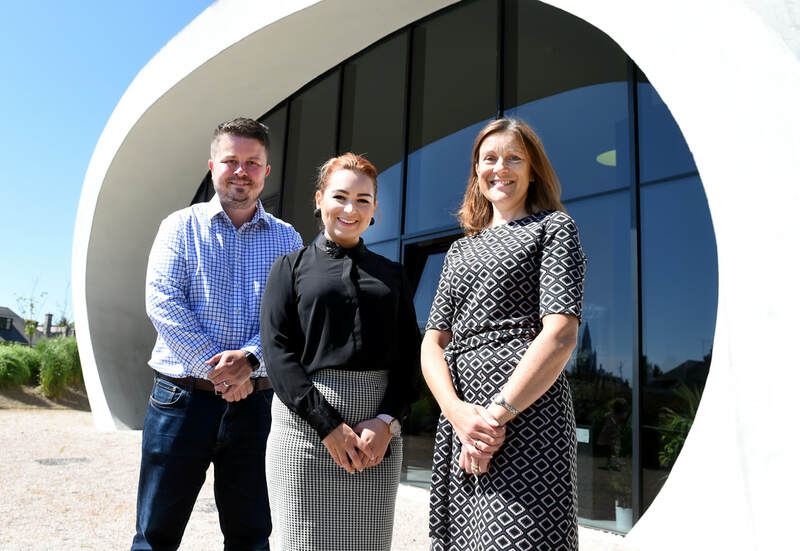 Aberdeen Young Professionals, a local talent network for young professionals working in and around the city, has partnered with Aspectus, as it looks to engage the next generation of energy and business professionals. Aspectus, which recently opened its own Aberdeen office to service its growing oil and gas client base, will help to raise awareness of AYP’s networking events. 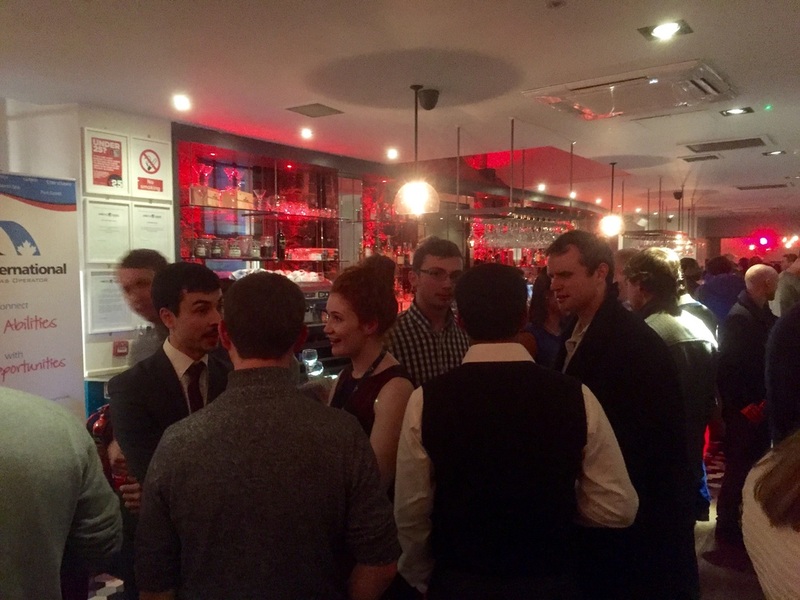 At its regular events, AYP enables young professionals to make useful contacts in a relaxed and sociable environment. The group currently has over 5,000 members. AYP Founder Ross Jolly has set up a new networking forum with Thor Holt. HellFighters O&G is a select group of like minded and committed Oil & Gas folks working together to share business and job winning ideas, encourage each other, problem solve & yes even to socialise in over good quality coffee, but in a structured and constructive way. In the current business climate, are you interested in an opportunity to work together with fellow Oil and Gas senior professionals to: encourage each other, build positivity, create collaborative operational and business development wins... and all this, with fine coffee!? That’s exactly what our delegates tell us they achieve, at our HellFighters Oil and Gas meetings. This LinkedIn group is all about the same spirit of collaboration and encouragement, but with your own coffee! So please do contribute even if you can't make a face to face HellFighters meeting straight away. Aberdeen Young Professionals are delighted to announce the recent addition of four new members to its management committee. From Left to Right - Jakki Ross, Ross Young, Claire Fleming and Steve White. With the new committee members in place it will allow the group to continually grow and develop into the voice for young professionals in Aberdeen City and Shire with further events and social meetings throughout the course of 2015-16. Ross Jolly (AYP Founder) commented - "We are delighted to have Jakki, Claire, Ross and Steve on board. They show a real commitment to enhancing the profile of the group within the local business community and also a hunger to help out young people build and develop existing skills and also grow their own professional networks." Hopefully Summer arrives soon.... Its the AYP Summer BBQ! The AYP committee have organised a BBQ with our sponsors 10 dollar shake at the new "Little Shake" bar at Rye and Soda. The team are praying for nice weather but at least with the excellent facilities on offer we can take the party inside if needed!! So why not join us for some great food and drinks at Little Shake on the 22nd August from 3pm. We are restricted to 40 tickets so please register your interest via the "Events Registration" page via the link above. 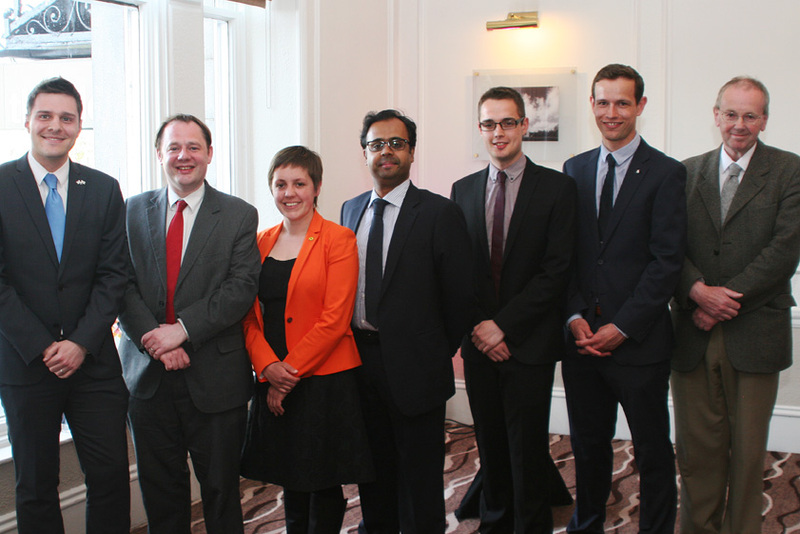 With the General Election on the 7th May, it was decided to invite the members from the four main political parties battling it out for Aberdeen City North and South to a hustings with Aberdeen Young Professionals. Despite the glorious weather outside we had a great turn out and some tasking questions for the candidates. A survey was sent out to the attendees prior to the event to find out their voting intentions. We followed this up with a post debate survey and the results can be found HERE. 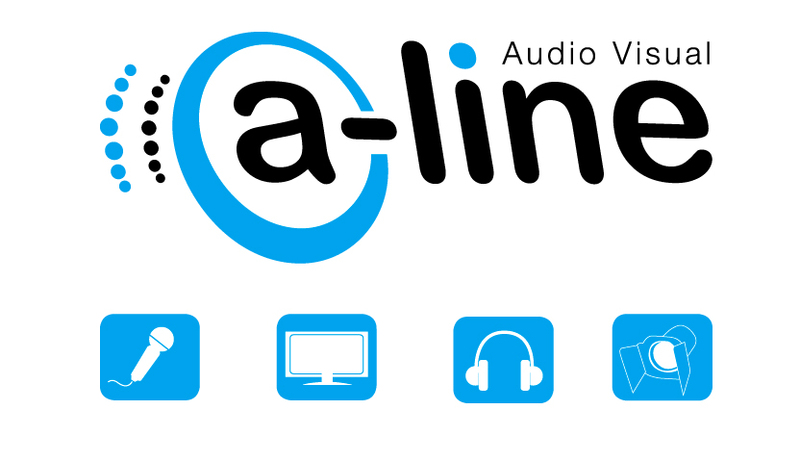 Huge thanks to our sponsors A-Line and Thistle for making the event possible together with the candidates and Thor Holt who provided a lively debate and food for thought for our attendees. 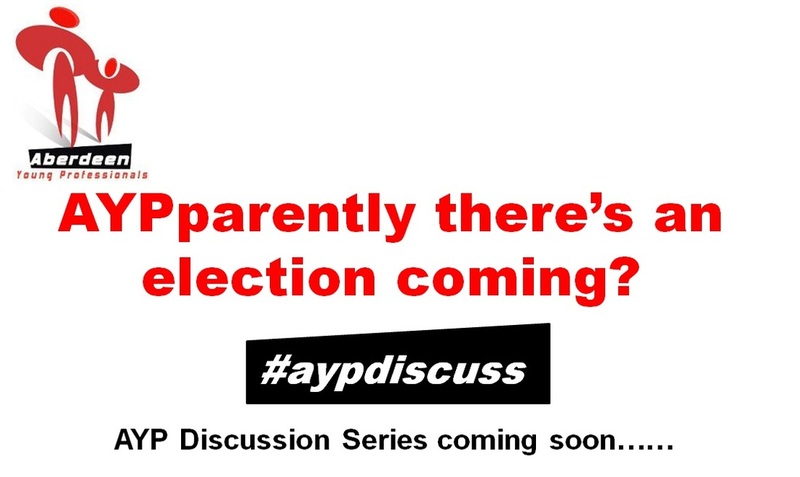 Aberdeen Young Professionals are looking forward to the launch of their much anticipated second instalment to their Discussion Series! AYP have secured their sponsors, presenter and panel for what promises to be a lively debate for our members to get involved in. The event will be on the 22nd April 2015 and further details will be provided via our social media/press after the official launch. Keep an eye on our social media channels and website as numbers will be limited for the event. ​Aberdeens 40 under 40 list! 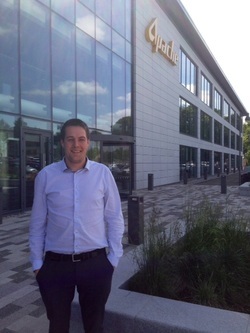 AYP were delighted that its founder, Ross Jolly, was named on the Aberdeen City and Shire 40 Under 40 list for 2014. 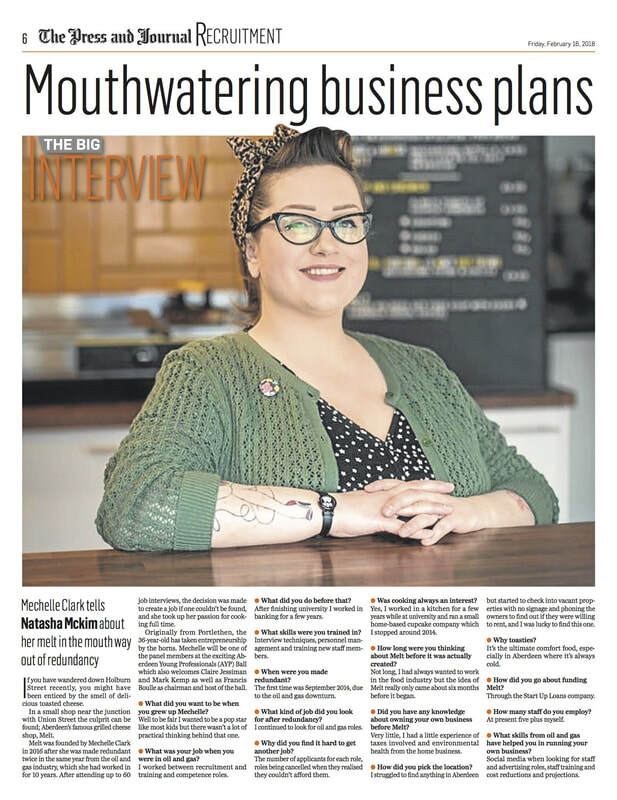 Aberdeen Business News and selected Partners are turning the spotlight on successful individuals, business innovators and local entrepreneurs who have already had an impact in their business sector whilst still under the age of 40. 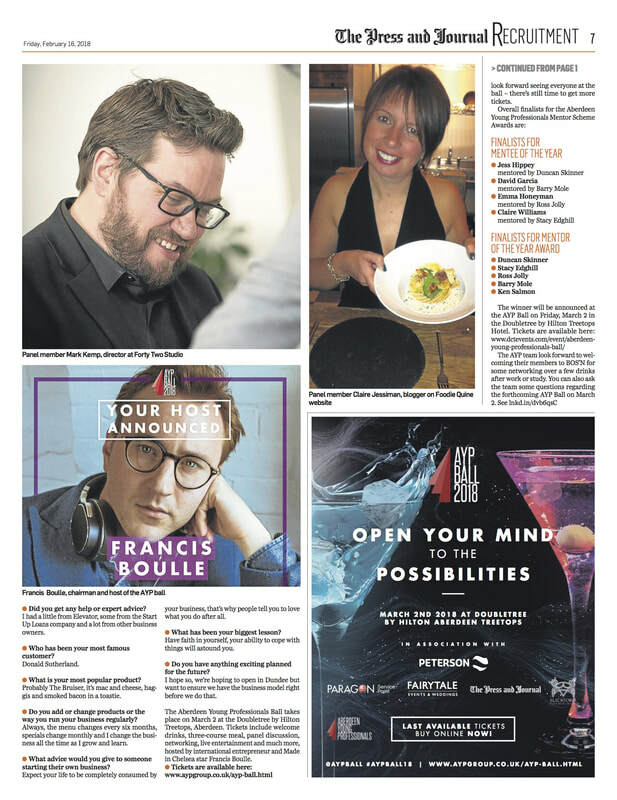 40Under40 aim to recognise and celebrate the young talent that exists in our business community by curating and publishing details of the forty leading figures aged under 40 who are currently working in Aberdeen City or Shire. Entries were assessed by a panel of judges, representing a range of sectors, to arrive at a final list of 40 individuals who fully embody the spirit of success. That's where you come in: we need volunteers from the wide range of associated careers to spend an afternoon inspiring and advising over 250 pupils in a speed networking type event. Of course this will count as CPD time so good employers should let you go in work time. Types of professionals required: admin, business management, communications and marketing, financial, HR, personnel, training, HSE, legal, logistics, procurement, purchasing, design, drilling, well completions, engineering, geosciences, IT, skilled trades, subsea, technician. ​the O&G industry first hand! Five teenagers joined Centrica's Exploration & Production HQ in Aberdeen for five weeks to learn more about the workplace and the oil & gas industry, as part of the national Career Academies programme. Some discovered a potential career within the oil & gas industry, others had their sights set on other careers but still learned skills which are vital across any sector. 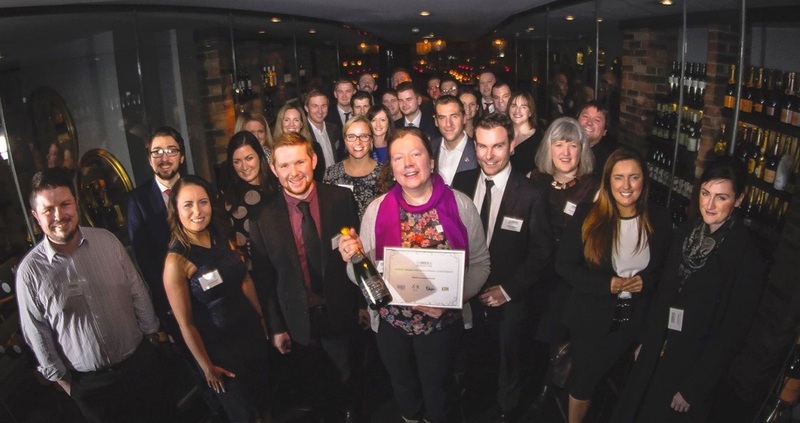 Great initiative and inspiring for the future Aberdeen Young Professionals! AYP Announce new stand sponsor! 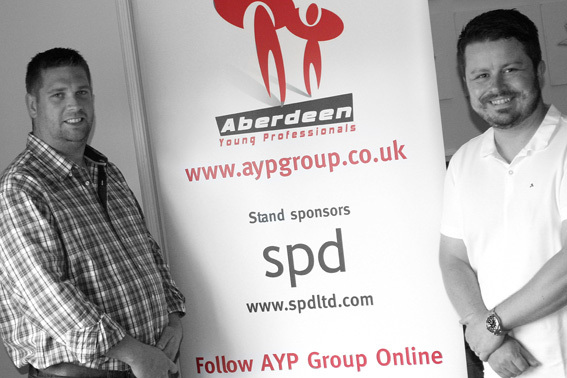 Aberdeen Young Professionals delighted to announce SPD as one of our new stand sponsors. The AYP Committee voted Ali Reid as the the Chairperson for AYP during 2014/15. 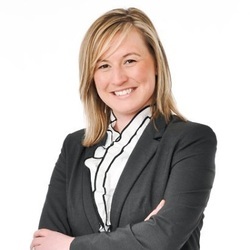 Ross Jolly (AYP Founder) said "Its great Ali put himself forward for the role as he has shown great enthusiasm and leadership during the organising of previous AYP events"
The AYP events team are also delighted to announce the appointment of Amanda Inglis who brings a wealth of experience to the events team. Welcome on board! Over one hundred young professionals flocked to Aberdeen Young Professional’s inaugural discussion series last month, “Attract, Train, Retain – Pipeline to Success”.The event was hailed a huge success as a panel of top recruitment decision makers from the oil & gas industry engaged the young audience in a debate on the skills gap crisis. For one graduate, the event was of particular benefit as he walked away fully employed with oil& gas exploration and production company Apache Corporation. Darran Falconer, who in recent years graduated from the University of Aberdeen with a first class honours in ‘Mechanical Engineering with Oil & Gas Studies’, impressed recruitment advisor Ross Jolly of Apache, with his enthusiasm and dynamic view on the crisis. This helped him obtain an interview with the company the following week, where he secured a position with the corporation as a Drilling Support Technical Associate. industry. Darran is an extremely intelligent and enthusiastic young professional, who shows great potential"
MB Productions becomes Aberdeen Young Professionals media partner! AYP Group are delighted to announce that MB Productions have agreed to become our media partner. They will assist us with our YouTube channel and also attend our events throughout the year. Visit the AYP "Membership Focus" for further information on the company.